ChildFund CEO Michael Kiely was among the attendees at the event to promote the SDG’s, hosted by RTE star, Ryan Tubridy. 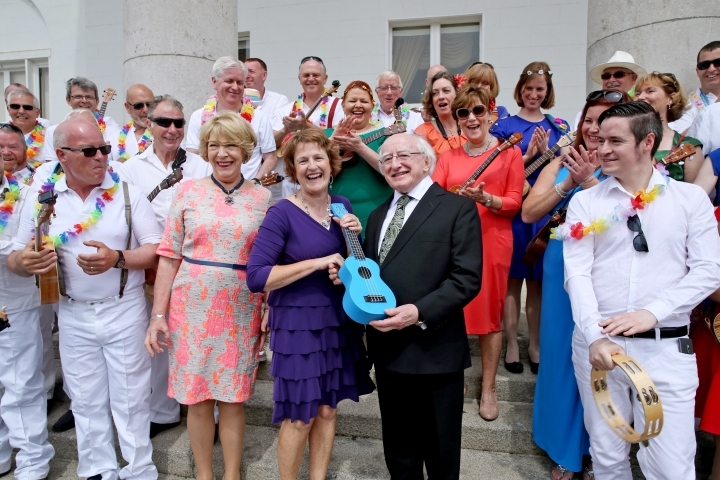 The splendour of the presidential residence Áras an Uachtaráin was the setting for a memorable garden party yesterday. The event was held to acknowledge the work of NGO’s like ChildFund, as well as civil liberty organisations, trade unions and entrepreneurs in fostering public understanding of the historic Sustainable Development Goals, and working toward their successful implementation. President Higgins’s characterised the gathering as being in essence, “a collective for sustainability”. The UN endorsed goals, agreed by world leaders in New York last September, chart the future of development up to the year 2030 and site the priority areas of inequality that require our collective attention, and drive. There are 17 goals and within those lie a total of 169 targets but ultimately there is just great aim,…to make the world a substantially better place for all global citizens by 2030. The inclusion of this specific language on child protection was secured largely as a result of the tirelessly efforts of the ChildFund Alliance and partner organisations in advocating for children. Referencing the refugee/migrant crisis, he stressed that some “42,000 people are displaced every day through acts of violence”. Discouraging the use of pejorative language that often see’s refugee’s in desperate flight characterised as “swarms” or “hoards”, Mr Higgins suggested that Irish people in particular should reflect on the long, perilous journeys taken at sea to seek refuge in foreign lands over the last several hundred years, and indeed the many who lost their lives in the process. Another area singled out for particular mention was the lack of real focus in development work hitherto, on eliminating gender inequalities, with less than 1% of the global development budget spent on this vital issue. The President said that this is insufficient and has to change in the SDG cycle, with much greater resources and emphasis placed on making the world a safer and more equal place for women and girls. Referencing the world population projections he said the planet will host some 9.4 billion citizens by 2050. A significant percentage of these will be young people with some 40% living in Africa. We owe this generation of young people better opportunities and a route out of poverty and exclusion he said. warning that achieving real progress will require new thinking and a fresh approach to development. The overall emphasis on the day however was one of positivity and celebration, as we look to embrace the challenges and opportunities presented by the SDG’s. In his closing comments, President Higgins reminded us that we are all “practitioners”of one kind or another and urged those present to, “work together for a sustainable, fair and just world”.